Have you ever thought about becoming a Fire Fighter? Fire Fighters have earned the reputation of being unsung heroes. They face dangerous situations with the intention of saving lives. Here is a brief job description and look into the process of becoming a part of a noble group of people. Is being a Fire Fighter in you? Fire Fighters are modern day heroes. Whenever an emergency arises these brave young men and women are usually first responders. In the event of an emergency the call is dispatch to stations. The closest station responds to the call by quickly assessing the situation and heading out to the location. There is always an element of surprise when working as a Fire Fighter. You never know exactly what a situation calls for or what will be the scene when you arrive on location. These Fire Fighters come prepared for anything that may arise in an emergency situation. They are train to respond quickly because every passing minute can save a life. 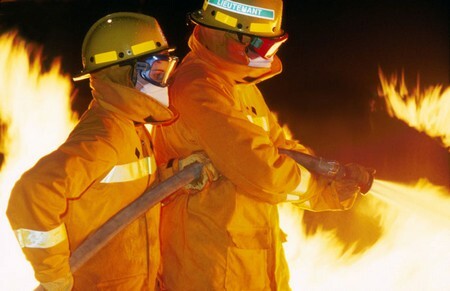 Fire Fighters have varied skill training. They arrive on call in case of fires to put out burning buildings. In those situations there is also the need to determine if anyone is trapped or injured. That’s not all. Fire Fighters are also trained Paramedics. In the case of automobile accidents Fire fighters respond to the call and remove victims, treat wounds and prepare the victims to be seen by a doctor at the nearest hospital. Firefighters are quick acting, focused and expected to remain cool and confident in an emergency situation. Most Fire Fighters also have the ability to be empathic but not too engulfed in the tragedy of the call that they are incapacitated and cannot help the victims. These abilities are more than likely present in the personality of the individual beforehand and honed by practice and procedure. If this is your personality, then maybe Fire Fighting is right for you. How can I become a Fire Fighter? In some districts the Fire Fighter applicant is required to have at least a High School Diploma or GED. Some regulations may require additional education such as a Fire Science Degree, Emergency Medical Technician (EMT) certification or Paramedic Training. These courses can be taken at local Community Colleges. The EMT certification trains the Fire Fighter how to stabilize an injured person on the scene while the ambulance is still in route. This training really saves lives. When applying expect a criminal background check and driving record check. Before you will be considered as a candidate you have to make sure that you are reliable enough to be trusted to drive a Fire Engine Truck. Also, there will be a face to face interview. Brush up on your interview skills and communications abilities. The interview is an important integral part of the process and can be the deciding factor as to if they enter you into the Fire Academy. You must be able to pass a series of demanding physical tests. These tests are standard and are in place to measure your specific levels of physical and mental strength, accuracy, endurance and agility. Some of the tests could be ladder climbs, tunnel crawls and beam walks. These are all exclusive to Fire fighters and imperative for the job. Look in to becoming a Fire Fighter today. You may just save a life.